Where is Terceira Island, Portugal? Terceira (AKA “The Lilac Island’) is part of the Azores archipelago which is located in the middle of the North Atlantic Ocean about 1,000 miles west of Lisbon and 2,500 miles southeast of New York. It’s one of the larger islands with a land mass of approximately 153 square miles and a population of about 53,000. 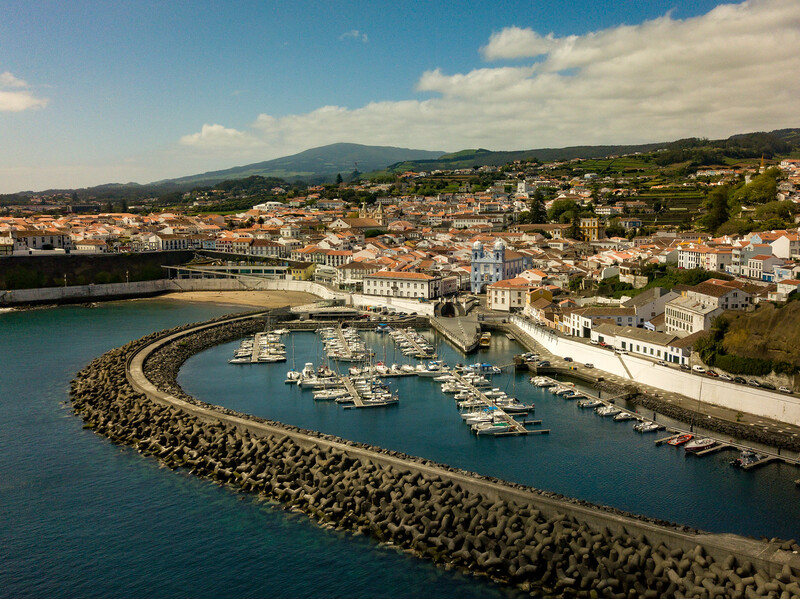 The oldest city in the Azores, Angra do Heroismo, is located on Terceira. Terceira, in Portuguese meaning “the third island,” was initially known as the Island of Jesus Christ. Settlement on Terceira Island began around the year 1450, but the island really came into its own during the 15th and 16th centuries, when galleons bringing wealth and goods from the Americas engaged in trade with ships from India. But I’m no historian, I would recommend visiting the museum in Angra to understand how this rock in the middle of the North Atlantic came to be. There’s a surprising amount of activities to do on an island this size. 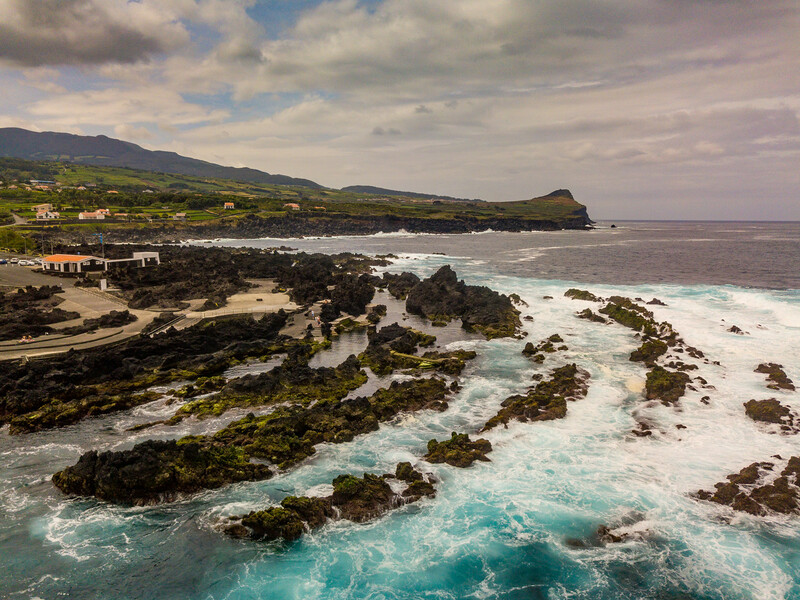 At first, we worried that maybe a week in Terceira would be too long, when in fact we could easily have spent more time leisurely exploring the island. Explore the lovely old city of Angra do Heroísmo. The town is best explored on foot. Admire the old architecture and charming homes. For ideas where to get the best viewpoints of the city, and places to eat, see below. 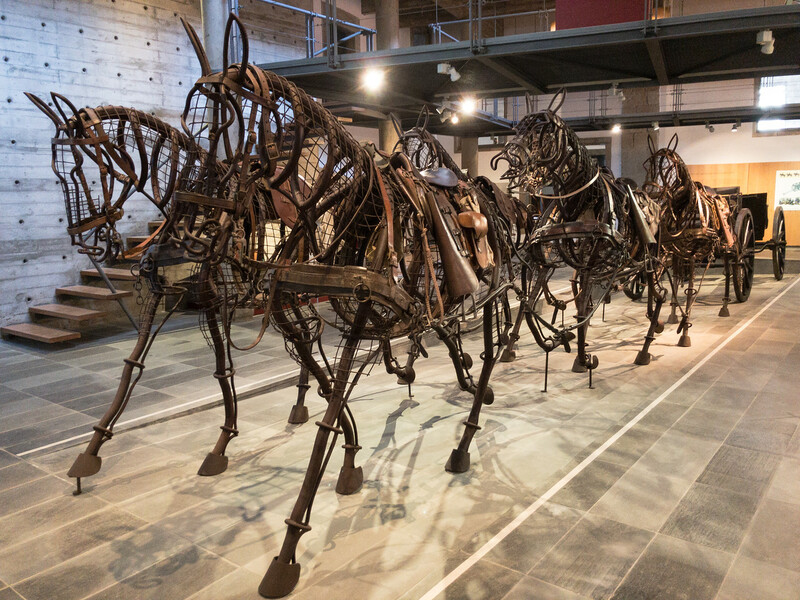 Visit the museum in Angra, excellent value at just €2 per person and surprisingly good. Listen to fado, there are some amazingly talented singers on the island. Fado is sung at the weekends at the Taberna do Fado and on Sunday evenings at the Fort. Hire a car (avoid GoldCar) and get out and explore the island. The roads are mostly good, and there’s not much traffic apart from the odd tractor and a few cows. Book your car before you arrive though, as there is a limited amount of vehicles on offer and public transport isn’t great, especially on weekends. Relax in the natural swimming pools of Biscoitos. There’s a cute looking wine museum in Biscoitos too, but unfortunately, it wasn’t open when we were there, so we will just have to save that for our next visit. Try some local Azorean food such as the cheese. Free cheese tasting is available at Quiejo Vaquinha aka Cheese Factory in Cinco Ribeiras. And you must try the delicious Dona Amelie cakes. Our guest house gave us some homemade ones, oh boy they were good! Not active enough for you, well there’s always whale watching, snorkeling, bird watching, hiking, golf, and exploring caves. If you visit in the height of summer, you can also join in local festivals or the rope bullfighting. Monte Brasil – Great views of the city, the island, and the ocean. It’s also a good spot for hiking and enjoying a picnic. Alto de Memoria – Offers excellent view of the city and Monte Brasil. The owner of our guesthouse dropped us off at the top so we could enjoy the view, then we strolled down the path, through the gardens to the town center. 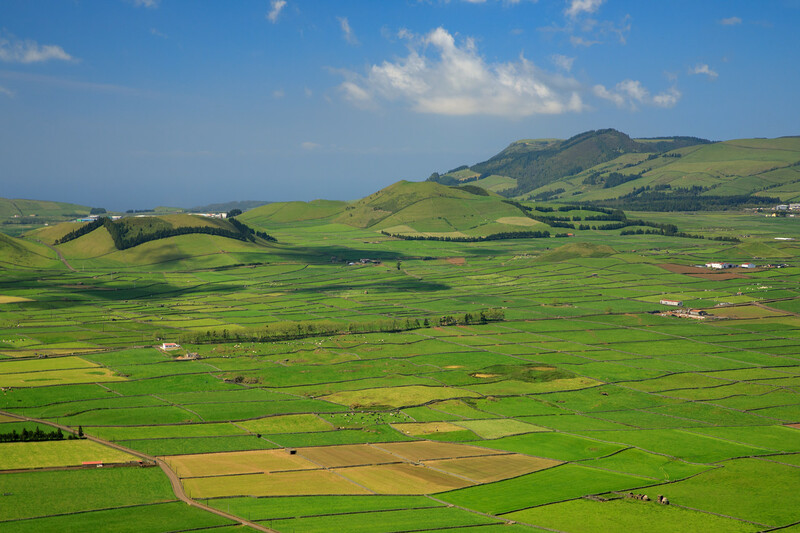 Quinta dos Açores – Great place for a view and the chance to try the delicious ice cream. I recommend the After Eight! We hired a car to explore the island. It really is the best way to discover the beauty of Terceira. Along the way, you’ll come across so many viewpoints ‘miradouros’. It’s a good idea just to drive slowly and stop often to take photos and admire the picturesque scenery. Although, be sure to drive up to Serra da Cume viewpoint. Alto Sé, Altos dos Covos1. Serves food all day. Fantastic cakes, try the cheesecake. Friendly service. Caso de Pasto A Canadinha, Avenida Infante Dom Henrique 24 E. Serves food all day. Good idea to make reservations at weekends. Huge portions and not expensive. Quinta dos Açores, Vinha Brava – Delicious ice cream with a view over Angra. Also, offers meals but we only tried the ice cream but the food being served looked good. Also, there’s a small market shop selling local produce. We stocked up on cheese here on our way home. A Pirata Gastropub, Rua da Rocha. – Nice place for a drink offering a great selection of craft beers. Friendly service. Closed on Sundays. 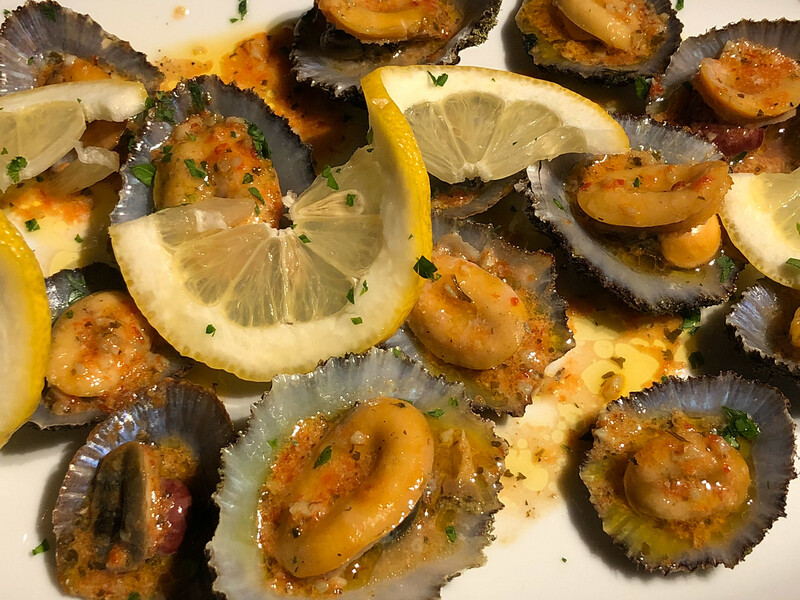 Taberna do Fado, Rua do Rego 74 – Great place to enjoy a drink, enjoy some nibbles and listen to Fado. The night we went, there were some amazing singers. Tasca das Tias, Rua de São João 117 – Nice place for dinner. Try the tuna steak or the pasta with shrimps. A Minha Casa, Rua Direita – One of the few places open on a Sunday afternoon. Excellent for sandwiches, wraps, and desserts. Friendly service and not expensive. Beira Mar, Caminho da Vila Maria – Popular seafood restaurant. Good idea to make an advance reservation, especially at weekends. Overlooks a small fishing port. 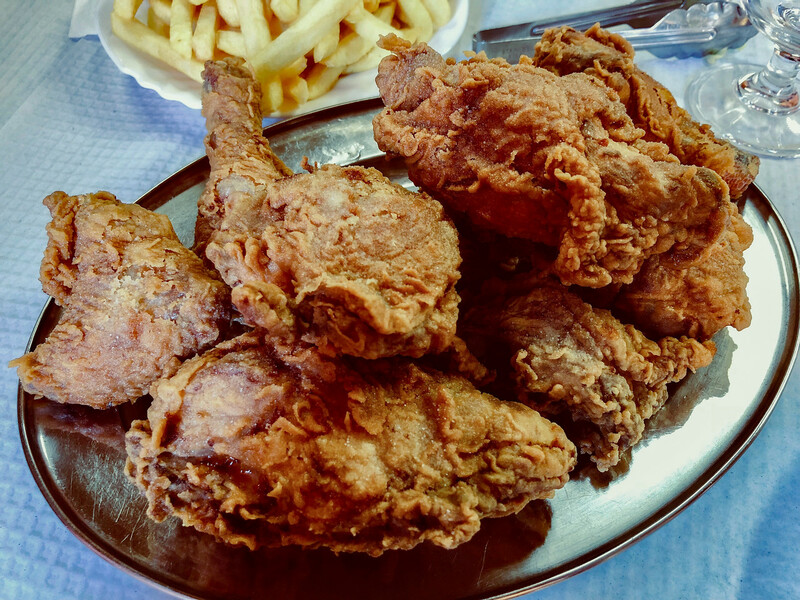 Valadão – Casa da Galinha, Rua Dr. Francisco Valadão 1 – American fried chicken. According to Jon, some of the best chicken he’s eaten in years. Been a family business for almost 40 years. There are hotel and accommodation on Terceira to suit all budgets – from five-star hotels to camping. We stayed at the lovely Quintal d’Angra in Angra do Heroismo. Great location, it even came with its own fully equipped kitchen so we could self-cater, but we didn’t as too many nice restaurants on our doorstep. The owners Xavier and Fatima were great too and really looked after us. Hire a car, but don’t book car rental GoldCar with Ryan Air like we did. Big mistake. They have a lot of hidden charges plus a very odd rule that because I was the lead name on our flight booking, that meant I had to be the primary driver. So the only way Jon could drive, I had no intention of driving, was to pay an additional driver fee. Makes absolutely no sense. Why he couldn’t be the primary driver remains a mystery. Hopefully, the credit card company can sort it out. So our advice, book through Kayak, we have never had a problem with them. Travel slow, stop often to take photos. 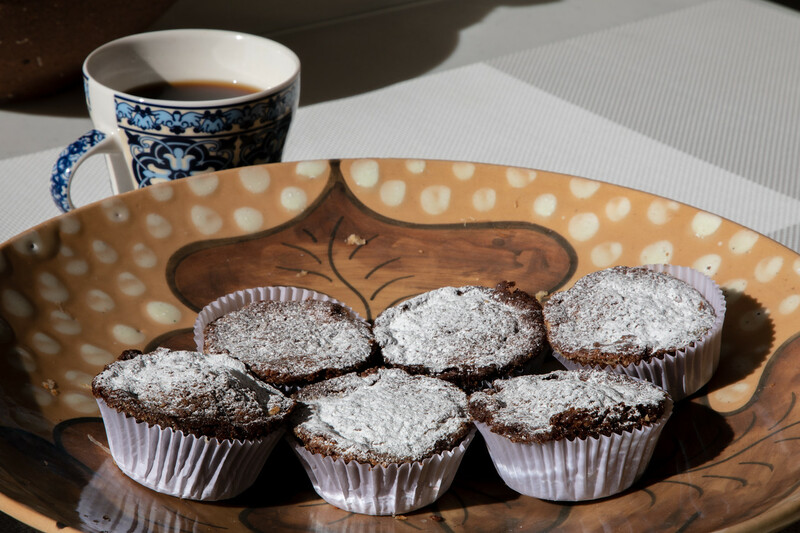 Try the local delicacies- the Dona Amelie cakes go well with coffee. Pick up some local cheese and enjoy a picnic as you explore the island. There are picnic spots all over the island. All the restaurants listed, we tried and can recommend. If you find another that you enjoyed, let us know so we can add to the list. Airlines with regular flights from North America to the Azores. Azore Airlines are the only airline offering direct flights from the US. Direct flights available from Boston. Flights from Terceira to other islands in the Azores are available with SATA airlines. I’ve been to Portugal a few months ago but unfortunately, I haven’t visited Terceira Island, Sarah. I obviously missed a lot not going there as the scenery is mesmerizing! These are some exceptional recommendations which I hope to follow soon! It was really lovely. I’m keeping an eye out for cheap flights, hoping to visit some of the other islands in the Azores! Very informative post. 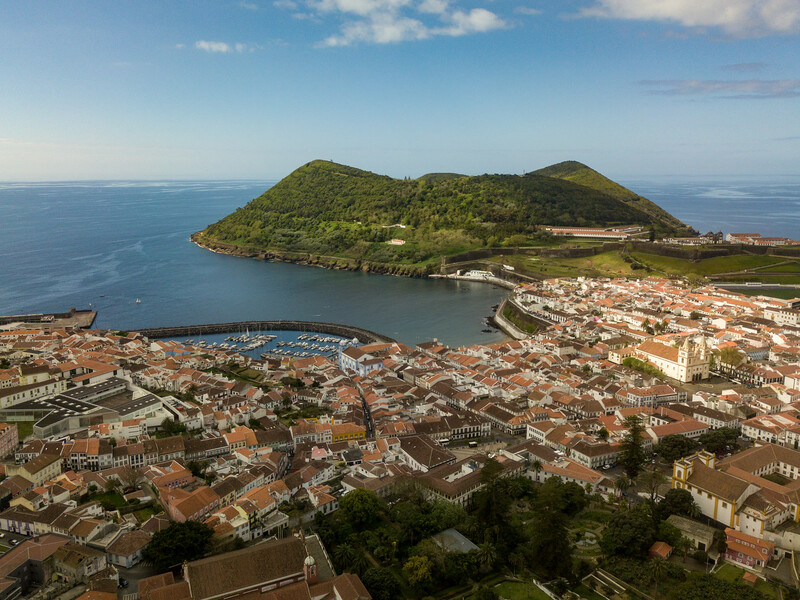 As an Azorean-born, I lived in Angra do Heroísmo several years before settling in the Portuguese Continent. When I visit Angra I often go to O Pirata. It has a splendid view over Angra Bay. It is a city full of history! Hi. 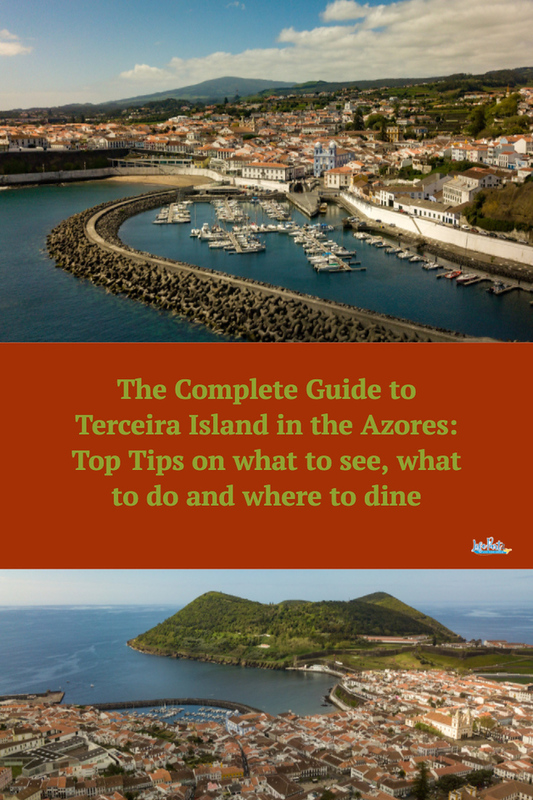 My husband and I are visiting Terceira next week for the first time and I appreciate all your tips. Can’t wait to see this island! Thanks for a great blog. We spent our honeymoon in the Azores 8 years ago. Terceira was our first stop and our favourite island. Angra is enchanting and we plan to go back. To tour the island, we negotiated a daily rate with a taxi driver (we just asked at the taxi stand until we found one who spoke English well enough.) It was like having a private guided tour of the island. We didn’t get to Captain’s Table, but we were tempted!